When it comes to Led Zeppelin people like to, for lack of a better phrase, "tell me things." The assumption always seems to be that they know secret things about the band that I'm just not aware of. That tradition truly started about fifteen years ago at a small New Age/Pagan gathering in Lansing, Michigan. I was sitting around, in a Led Zeppelin shirt* of course, minding my own business when a guy who looked like 1974 came up to me and said "Dude, did you know that the song Gallows Pole is a meditation on the Hanged Man tarot card?" Not knowing exactly how to answer, my younger (dumber) self mumbled something about how I was already aware of that, which I wasn't. When I got home that night I dutifully went upstairs to my room, dug up the second CD from Led Zeppelin's 1990 boxed set, and sat down with the tarot's Hanged Man card. I stared at that card for a good fifteen minutes, with Zep's Gallows Pole on repeat for the whole time. I'm not sure what I expected to happen, but what I expected was certainly more than the nothing that occurred. I'd move the card really close to my eyes, and then as far away from me as my arm would reach, and I did this over and over again trying to gain some divine insight into the world, Led Zeppelin, and the occult. Thankfully, no one was around to watch my stupid card trick that evening. Led Zeppelin does has have a history with the tarot, it's jut not quite as spectacular as the dude stuck in 1974 would have had me believe. Most of the association between Led Zeppelin and tarot is due to 1971's Led Zeppelin IV (also sometimes called Runes or Zoso in honor of the glyphs associated with it), and even some of that is wishful thinking. At another more recent festival I had just finished up presenting my Led Zeppelin and the Occult workshop to 75 mostly non-napping people, when a young lady come up to me with a tarot card in her hand. She wanted me to know that the figure on the front of Led Zeppelin IV represented the Ten of Wands. According to Jimmy Page (guitar, and if you don't know who he is I have no idea why you are reading this) the cover to Zep IV came about when "Robert found the picture of the old man with the sticks and suggested that we work it into the cover somehow. So we decided to contrast the modern skyscraper on the back with the old man and the sticks-you see the destruction of the old and the new coming forward." I'm not entirely sure that's true either, but there is probably something to the claim of contrasting new and old. 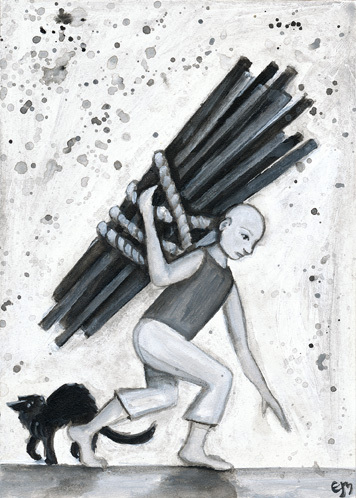 The classic interpretation of the Ten of Wands has nothing to do with that balance, and instead represents either a large burden, or being unable to see the road in front of you (perhaps because of that burden). The man in the picture is a little stooped over, but he doesn't seem especially troubled by it. The card I was shown by the lovely lady in question that day did look a lot like the cover of Zeppelin IV, in fact, it looked almost exactly like it. I was actually a bit stupefied that day thinking I had come across something I had previously been unaware of. When I got back home after the festival I began researching the Ten of Cups and was disappointed to find that the reverse of what this girl had told me was true. The cover of Led Zeppelin IV had inspired a reinterpretation of the Ten of Wands, and that the original Ten of Wands was something else entirely. Since the Ten of Wands/Old Man Cover was brought to my attention I've seen multiple decks with sticks on the back, and all of them date to after Zep IV. I think it's cool that Zeppelin inspired something, but it's not the cover of Zeppelin's fourth album that links the band to the tarot, it's the album's gatefold sleeve. The most striking tarot related image in the Led Zeppelin catalog is on the gatefold sleeve of Zeppelin's untitled fourth album and features the Hermit from the Major Arcana. Jimmy Page has been exceedingly blunt about the fact that it's the Hermit, “The inside cover was painted by a friend of mine. It's basically an illustration of a seeker aspiring to the light of truth." (The work was credited to the artist Barrington Colby-Mom, who subsequently then fell off the face of the earth.) The Hermit card must have been pretty important to Page, because he dresses up in hermit garb for a silly sequence in the Led Zeppelin concert movie The Song Remains the Same. Of course the Hermit represents the search for truth and wisdom, precisely the kind of soul searching that seemed to go into the lyrics of "Stairway to Heaven." The Hermit on that particular album sleeve makes perfect sense when paired up with "Stairway," the ultimate song about soul searching. After Led Zeppelin IV the band handed off the album cover art duties to the British firm Hipgnosis, who also designed album covers for bands like Pink Floyd. I don't want to say that the tarot imagery stopped because of Hipgnosis, but it never graced the inside of a Led Zeppelin album again. Perhaps just because it couldn't be topped, hard to say. Page obviously remained proud of his association with The Hermit, appearing as the old wizard in 1976's The Song Remains the Same concert movie (though that sequence was filmed several years earlier), but was that the last explicit tarot reference in the music or art of Led Zeppelin, until possibly 2003. 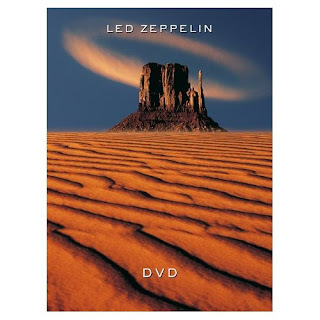 On May 27 2003, Led Zeppelin released a two disc DVD set of live concert footage, none of which had been officially released to the public before. To say that day was a national holiday for me is an understatement. I took the day off from work to listen to "get the Led out" and listsen to Led Zeppelin literally all day. Upon purchasing the DVD set I was struck by the cover art, featuring some old crumbling mountains standing alone, surrounded by desert. The mountain in the picture doesn't look entirely natural either, it might be something that was carved by human beings. It's old and crumbling, but still standing proudly, ravaged but remaining upright in the face of adversity. It implies a certain eternalness, "age may weather me but I will still remain," type of thing. This king of imagery is common on the tarot card known as "The Tower." 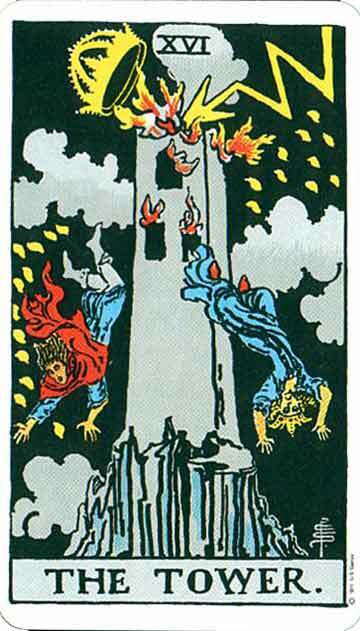 The Tower has several different interpretations in Tarot. Some of them are quite negative, some more positive. 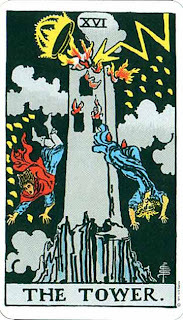 The original symbolism of the card probably relates back to the Tower of Babel, which would be fitting for the band that wrote and recorded Stairway to Heaven. I'm not quite sure if the DVD art and the Tower card are related, but the base of the Tower and the base of the mountains on the DVD box tend to make me believe I'm on the right path. No matter what all the art means in Zeppelin, the band does stand eternal. Even now, forty odd years after their first record they continue to move three million albums annually. That's impressive. Trends come and go, but Led Zeppelin remain, kind of like Tarot Cards. *All of my clothing either has rock band logos on it or sports teams stuff. Nice article, Jason. Being a Zeppelin fan myself I found this very interesting. In fact, my 18 year old son is a big Zepp fan so I'll share your writings with him. The rock is thought by Navajos to be a God or spirit that threw itself into the desert and became a stone. It was actually once a volcano: the rock of the mountain itself eroded, mingling with the desert sand, but the lava still stands, being harder and thicker (lava essentially becomes glass). Beside the Shiprock there are many other lava tors in the southwest Rockies. I'm sure the Zepplin photo is one of them. Very cool. I personally use the tarot and only recently saw the connection between the cards and Led Zeppelin album covers. Nice article! I am actually doing a series of art works using "Zeppelinism" to create tarot card art.